Melvin Bratton had a standout career at the University of Miami during his five seasons in Coral Gables. 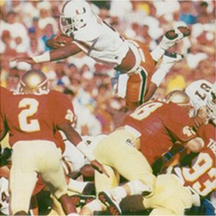 As a runningback and fullback, Bratton ran his way into the UM record books as well as leading the team to the 1987 national championship over Oklahoma in the 1988 Orange Bowl Classic. Melvin’s accomplishments can still be found in the football record book with his 32 career touchdowns tying for third all-time, and his 26 rushing touchdowns fourth-most. When he completed his career in 1987, he was listed among several record holders including points scored (3rd, 192), touchdown receptions (6th) all-purpose yardage (8th, 2,455), rushing (9th, 1,371) and receptions (9th, 86). After getting injured in the 1988 Orange Bowl against Oklahoma, his final collegiate game, the sure-fire first round pick was forced to rehabilitate and wound up a sixth-round selection of the Miami Dolphins. Melvin Bratton declined to play in his first season out of college prepping his knee for the next season when the Denver Broncos selected him. Melvin played with the Broncos from 1988-91, and later became an NFL scout with the Washington Redskins.